New Curriculum in Redeemer Kids! Something new has come to Redeemer Kids! Beginning January 1st, we implemented the use of the Gospel Story Curriculum, a three year program that will walk our children ages 3 and up through the entire narrative of scripture. We will spend the next 18 months in the Old Testament at which time we'll move on to the New. A month in to using it, I can confidently say we are loving it! Our favorite thing about this curriculum is how it focuses so clearly on Jesus and his gospel. For example, last week our kids talked about the story of Noah. As you can imagine, they learned all about how God saved Noah and his family from the flood. But they also learned how God saved us by saving Noah. How? Because without Noah, we would have no Joseph and no Mary. By saving Noah, Jesus could be born. Our kids talked about how just like the ark was the only way to be saved from the flood, Jesus is the only way we can be saved from our sin. And so each week, no matter the story, our children hear the gospel of Jesus. As a result, they are learning that the Bible is not a collection of little stories, but rather one story with Jesus as the hero. Are you interested in teaching your children more about the Bible at home? Maybe you've considered starting a family devotional. But the days are busy. And you don't know where to begin. 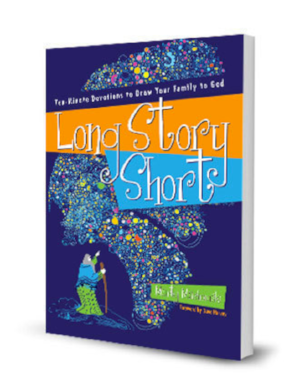 We would like to suggest a family devotional program called Long Story Short: Ten-Minute Devotions to Draw Your Family to God. This devotional is suitable for children ages preschool though high school and corresponds to the Gospel Story Curriculum we are using on Sunday mornings. Check it out at the link above. But no need to purchase online! We have purchased several copies which are available to you for just $10 (that's a huge discount!) at the Redeemer Kids resource table on Sunday mornings. You may be thinking, "okay, all of that is great, but my child is not three yet. What is he/she learning on Sundays?" Our youngest ones use a curriculum by Children Desiring God entitled, A Sure Foundation. This curriculum leads our nursery volunteers to pray specifically for each baby by name, while the children in our Toddlers and Preschool 2s classes hear foundational Bible stories and learn simple truth statements. Our toddlers repeat the same lesson for an entire quarter, while our preschool 2s move on to a new lesson each month. Questions? Contact our Kids Director, Faye Cummings, at [email protected]. Website Designed By: TEHAUS CREATIVE CO.